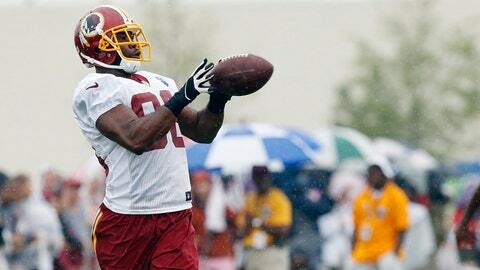 Pierre Garcon wants to take this issue to court. Washington Redskins wide receiver Pierre Garcon filed a class-action lawsuit against popular daily fantasy sports website FanDuel on Friday, accusing the site of profiting off his name and likeness without permission. The lawsuit filed Friday in federal court in Maryland, where the Redskins play their home games, represents the latest legal challenge for the lucrative daily fantasy industry, which has attracted scrutiny since a multimillion-dollar advertising blitz at the start of the NFL season. According to Garcon’s lawsuit, FanDuel has repeatedly used his name and likeness in its TV ads and on its website without his consent. Garcon claims that he and other players should be compensated by FanDuel for the use of their names, which he says has driven up revenues for the company. Garcon said in a statement that he was bringing the lawsuit "on behalf of myself as well as any other players who are being treated unjustly." He said he would not have any further comment while the case is being reviewed. The Redskins have a bye this week. The lawsuit notes that Garcon’s name appears frequently in FanDuel commercials, including a 28-minute infomercial in which his name is seen 53 times. FanDuel spent more than $16 million on advertising during the first week of October, the lawsuit said. "We believe this suit is without merit," FanDuel said in a statement. "There is established law that fantasy operators may use player names and statistics for fantasy contests." Members of Congress have called for hearings into the daily fantasy sports industry, and New York-based FanDuel and its chief rival, Boston-based DraftKings, have attracted the attention of regulators in Massachusetts and several other states. Recent revelations that employees of the two companies often played on competing sites have raised questions about possible insider information being used to win. The companies claim their sites aren’t gambling, are legal, and were exempted from a federal online gambling prohibition in 2006. Players pay an entry fee to compete for cash prizes based on the performances of individual players. FanDuel has a marketing partnership with the Redskins, who have a "FanDuel lounge" at their home stadium, FedEx Field in Landover, Maryland. DraftKings has a partnership with the NFL players’ union that allows it to use player names and likenesses. Unlike other U.S. sports leagues, the NFL does not have an official daily-fantasy partner.